The Santa Fe Woodturning Lab is the private studio of Laura Yeats, Wood Artist. Laura has taught experiential learning workshops in design and craft for over 10 years, first in Seattle, then Orcas Island, and now in Santa Fe. Her signature workshop The Wood Bowl - From a Tree to Your Table is a comprehensive and rewarding immersion into the design and making process utilizing a unique local resource of fallen and salvaged trees. She teaches individuals, two companions and small groups up to four adults. 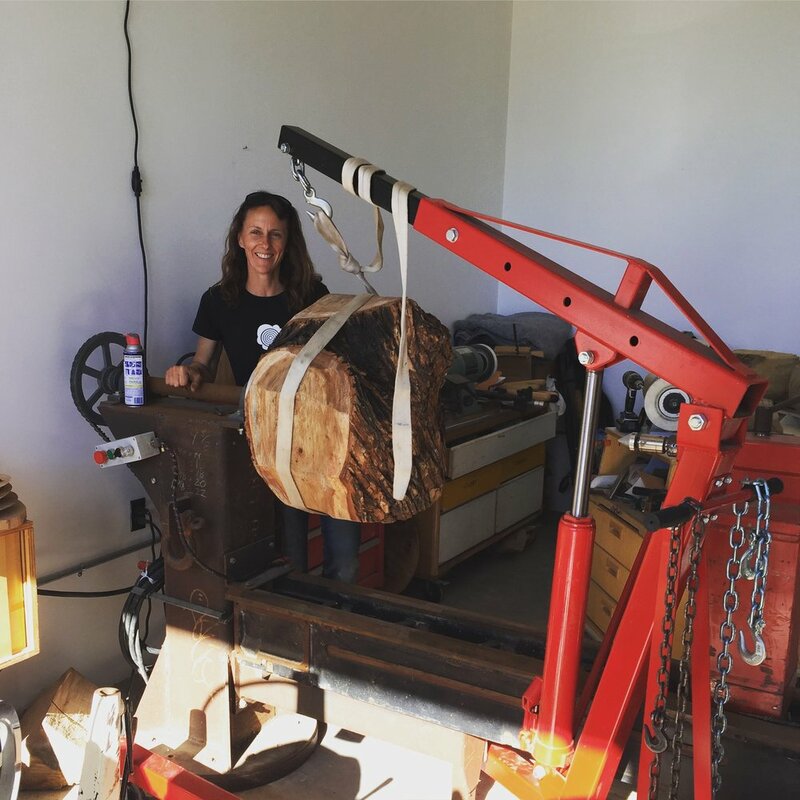 In 2018 Laura formed the Santa Fe Woodturning Lab to introduce additional instructors and expand instructional offerings. The Lab is located adjacent to MAKE Santa Fe in the Siler District. I offer an exclusive design + craft learning experience at my private studio in Santa Fe, New Mexico. My workshop The Wood Bowl - From a Tree to Your Table is a comprehensive immersion where students explore the qualities and nuances of natural materials, learn principles of form and design and develop fine craft skills. Each student makes at least one beautiful bowl from a local fallen and salvaged tree. My workshops are designed for those wanting to learn with intention and focus in a safe, intimate environment. Students will make bowls from start to finish, literally from a fallen tree through to a finished bowl they’ll take home and enjoy. In these immersion workshops students tend to experience deeper learning and bigger breakthroughs as they develop their craft. I approach my personal work through connection and intuition. My best creations come when I allow myself to work in isolation where I can tune into the natural environment and hopefully gain insight and inspiration for my pieces. In my creative process, I seek the essence of beauty, simplicity and purity, and as a result my work is mostly free of adornment. I hope that what I create is both a pleasure to look at and a delight to hold, but also an accurate translation of my connection to nature. Laura’s formal education is in architecture and urban planning from the University of Washington. She studied furniture design and craftsmanship at Seattle’s Pratt Fine Art Center and traveled for intensive woodworking study at several destination arts and crafts schools including The Krenov School, Penland, Haystack and a one-year residency at Arrowmont. Laura has been in business since 2000, initially as a custom furniture maker, and now creating one-of-a-kind bowls and sculpture. In addition to her studio offerings, she teaches Woodturning at the Santa Fe Community College. She previously taught in Seattle at the University of Washington, College of Architecture, Furniture Studio and at Pratt Fine Arts Center.